With its lightweight and durable ALUXX aluminum frame and upright flat-bar positioning Alight is comfortable for a daily commute and sporty for longer rides. Women’s-specific geometry and sizing gives Alight a stable confident ride quality. And thanks to integrated dropouts it’s easy to personalize with racks and fenders. Cyclestore.co.uk is a long-standing UK stockist and dealer of Giant bikes. We carry the full range of Giant Road and Mountain Bikes as well as clothing and accessories. To find out more about the full Giant range at Cyclestore.co.uk, visit the Giant Bikes homepage here. PEDAL TO WORK MEET FRIENDS FOR COFFEE OR BUILD UP FITNESS ON THE BIKE PATH. ALIGHT FITS RIGHT INTO A FUN HEALTHY LIFESTYLE. An upright riding position flat handlebars and 3F Design Philosophy make commuting or a casual spin comfortable without compromising efficiency. Equipped with integrated dropouts for racks fenders or panniers this bike blends urban style and road bike agility. 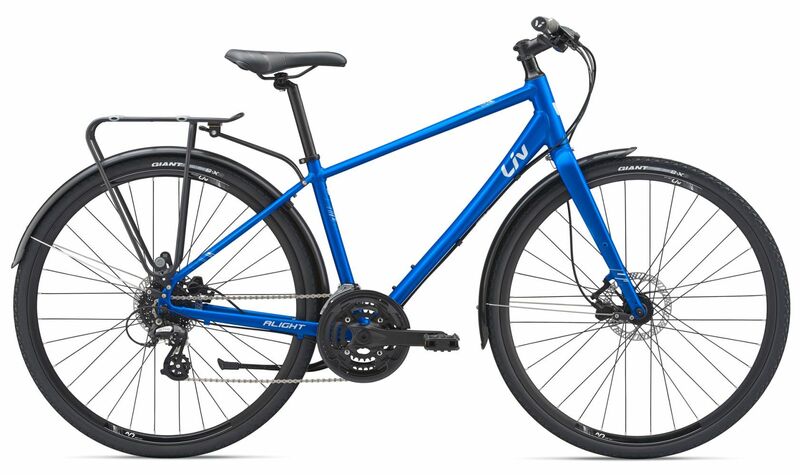 With its lightweight design and upright flat-bar positioning this premium bike makes it easy to pedal to work zip around the city and get out onto country roads. Add a rack and panniers for more extensive weekend exploration or in-town carrying capacity. Modern finishes keep style at the forefront of every ride. Please see below for delivery options for Giant Liv Alight 2 City Disc Womens Sports Hybrid Bike 2019.